September 13, 2009 -- Life on the Left -- Colonisation. Conquest. Words that even today evoke widely varying historical memories. Just last year Quebec City staged an elaborate round of events to celebrate the 400th anniversary of its founding as the colonial capital of New France. No expense was spared as federal and provincial governments alike poured money into the city’s coffers. Capping the ceremonies were massively attended concerts by Québécoise singer Céline Dion and former Beatle Paul McCartney — apparently deemed emblematic descendants of the French and British “founding peoples” of present-day Canada. It seemed to be one great love-in of all those involved. June 24, 2009 -- The movement to call Israel to account for its crimes against the Palestinian people is growing, it is “invading the mainstream discourse, becoming part of the constant and unrelenting drumbeat against Israel”. It could eventually threaten the existence of the Jewish state by undermining the support it receives from its strongest backer, the US government. That was the message of alarm delivered by the executive director of the American Israel Public Affairs Committee, Howard Kohr, to the AIPAC Policy Conference on May 3. 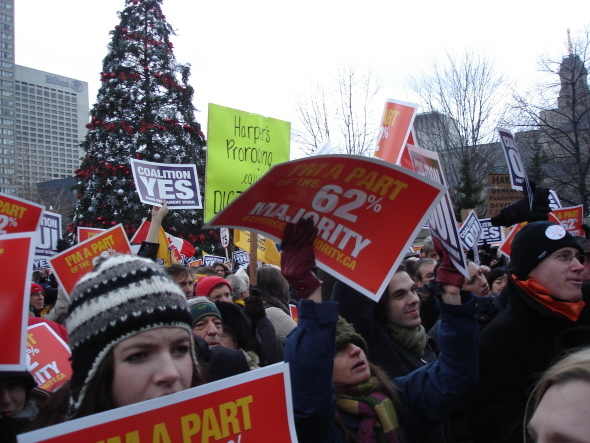 Rally in favour of a Liberal-NDP coalition, Toronto, December 6, 2008. October 19, 2008 -- Once again, the Bloc Québécois has taken a majority of Quebec’s seats in Canada's House of Commons — 50 out of 75, one less than in 2006, although down by three percentage points. In doing so, it dashed Prime Minister Stephen Harper’s hopes of a Conservative breakthrough in Quebec that would deliver him a majority government in Ottawa. Working people throughout Canada heaved a sigh of relief. The Bloc’s support is more than a rejection of the Tories’ right-wing policies. As Bloc leader Gilles Duceppe declared on election night, October 14, it is a clear demonstration “that Quebec is a distinct nation linguistically, culturally, socially and economically”. 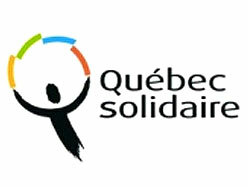 This was the sixth consecutive federal election since 1993 in which the pro-sovereignty Bloc has won a majority of Quebec’s seats under the first-past-the-post system. A selection of articles from Canadian socialists discussing the October 14 federal election and the debates and discussions in the Canadian and Quebec left and labour movements on electoral tactics. Canada’s elections: What’s the alternative to the Tories?